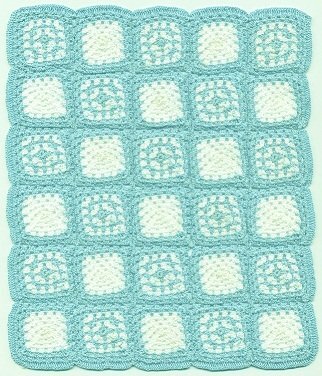 When starting to crochet you will somewhere along the way learn how to make a granny-square. After you have learned how to make this pattern you might start to wonder what to do with it now. It's just a square of crocheting with holes all through it. The most basic thing that you could do with this square is to make a blanket, but this takes a lot of work and most of us don't have the patience for that. True if you use variegating colors and different yarns you can make a really bright and cheerful blanket. As an idea for making a blanket you can try making a bunch of small granny squares instead of just one big one. The number of squares you can make a blanket with can range from one or four to a hundred or two squares. Very often these blankets made of small squares are prettier and easier to make then the ones made with just one large piece. They can be easier to make because you actually feel like you are getting more accomplished with each small square then if you were just grinding away at one large one. If you are looking for a slightly smaller project to work on you also try making a bag with the granny-squares. It's a lot easier to make two of these geometric shapes into a bag then it would be to make them big enough for a blanket. You can make the bag by sewing two of them together like the bag below, or you can try making the bag out of many of these small shapes. Another idea for a design is to have one big one in the middle surrounded by a row of small granny-square of different colors. 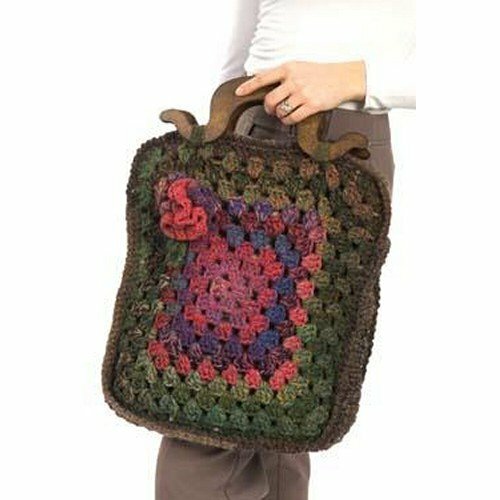 There are many types of bags that can be made with the granny. You can have anything from a hand clutch to a full backpack made with a drawstring or zipper, depending on how much work you put into it. There are many other ways for you to use these handy little shapes. You don't have to be stuck on just making one giant square as a blanket. This shape may be simple but it is very versatile in what it can be used as.